There are times when something functional is also highly ornamental. Watering cans and terracotta flowerpots fall into this category. Baskets too, but usually not hoses and sprinklers. 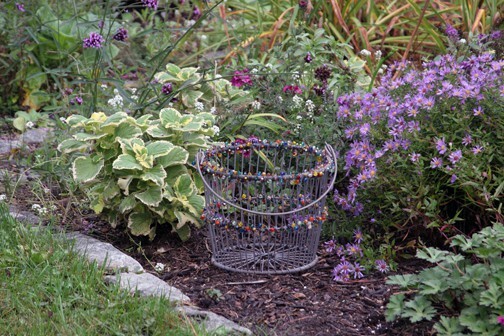 I think that a common clamming basket, as is or adorned, is perfect in the garden, form and function. They are attractive and weatherproof, plus they’re the perfect receptacle for weeds. Every gardener pulls weeds on the fly, as we walk from one part of the yard to another, or go into the garden for other purposes. Short bouts of weeding fit into busy lives better than an entire Saturday morning spent pulling out unwanted plants, and tossing the plants into a nearby metal basket is so convenient. Paint them different colors, weave assorted ropes and wires through the sides, or leave them plain. They’re heavy enough not to blow away and they don’t hold water, so if it rains your pulled weeds won’t become a bucket of swamp. Clam baskets belong in the garden.